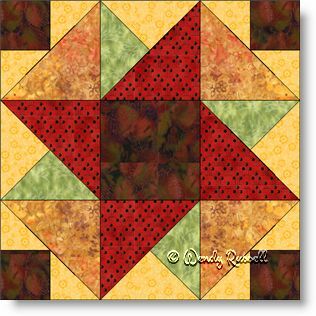 The Rolling Wheel quilt block is a great teaching aid to introduce the three quarter square triangle patch. This unit is a bit of a misnomer because yes, there are three triangles in the patch, but not all of the triangles are quarter square triangles. However, this patch is a useful one in order to make a pinwheel type of quilt block. Have fun with this design and watch secondary designs emerge as you lay out this block in a variety of ways. The sample quilts show two different results by setting the blocks "on point" rather than straight across. By changing up the setting triangles, you get a totally different look.